A normalization process is proposed to serve not only as a preprocessing stage for compilation and evaluation but also as a tool for classifying recursions. Then the query-independent compilation and chain-based evaluation method can be extended naturally to process a class of DOOD programs and queries. The query-independent compilation captures the bindings that could be difficult to be captured otherwise. The chain-based evaluation explores query constraints, integrity constraints, recursion structures, and other features of the programs with a set of interesting techniques, such as chain-following, chain-split, and constraint pushing. 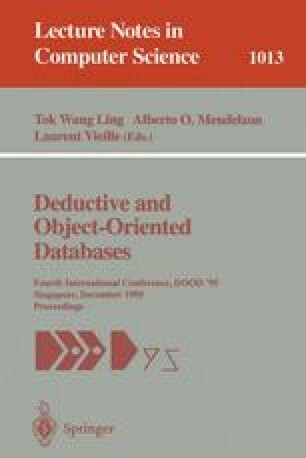 Therefore, with this normalization and compilation process, a class of DOOD queries can be evaluated efficiently in deductive and object-oriented databases. Research is partially supported by the Natural Sciences and Engineering Research Council of Canada under the grant OGP0037230 and by the Networks of Centres of Excellence Program (with the participation of PRECARN association) under the grant IRIS-IC-2.